I am often asked what my choice would be if limited to but one handgun. Usually these type questions are only an exercise of the mind, as no sane person would purposely impose a limit upon himself of only one handgun. Normally, I try to avoid the question by qualifying the role which that handgun must fill. For any given purpose, there are some choices that would serve much better than others. However, if cornered into actually answering the question, and if I truly could have but one handgun, I would choose a twenty-two rimfire of some type. For most purposes, a number of other handguns would be better than a twenty-two. For defense against large animals, a big bore revolver loaded with heavy cast bullets would be much better. For social work, a center-fire semi-auto could better fill the bill. For hunting deer and other medium to large game, a good forty-four magnum would be as good as anything. 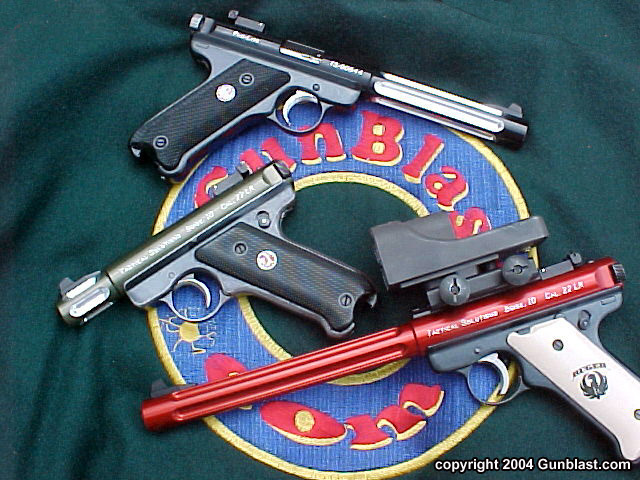 However, these handguns can be, if necessary, replaced by a good rifle. Most people can shoot a rifle more accurately than they can a handgun, and I find that I usually carry a handgun while hunting in addition to, rather than in place of, a rifle. 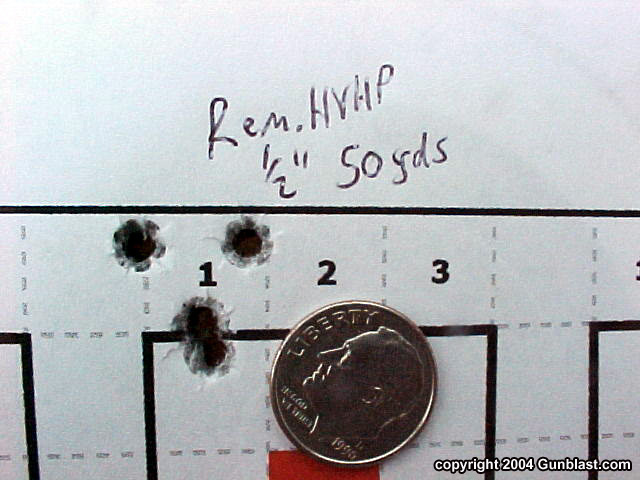 For general use as a second firearm, a good twenty-two is very useful. The little cartridges seem to kill very efficiently; all out of proportion to their small size. Many hunters carry a twenty-two for a close up finishing shot, or to collect small game while on a big game hunt. For social work, the twenty-two rimfire would be almost no one’s first choice, but it has in the past and certainly will continue to be used for defense when necessary. One of the best, and probably the most popular, use for the twenty-two is just plain old fun. While thousands of rounds of twenty-two cartridges are expended annually for serious target work, millions are fired at targets of opportunity just for the pleasure of plinking. The cartridges and the guns are relatively inexpensive, and the recoil and noise are almost nonexistent. I believe the twenty-two long rifle cartridge to be one of the most useful ever invented, and if forced to choose but one handgun, it would be chambered for that little round. I have several favorites when it comes to twenty-two handguns, and choosing between them would be more difficult than choosing the hypothetical "one handgun" cartridge. The market is saturated with good twenty-two pistols and revolvers, and I own my share of them. One of my favorites, and the most popular twenty-two pistol on the market, is the Ruger semi-auto in its many various forms. For over fifty years, Ruger has built one of the most reliable, accurate, and durable little pistols ever made. Recently, Tactical Solutions in Boise, Idaho has brought to market one of the finest improvements to the Ruger auto that I have ever seen. 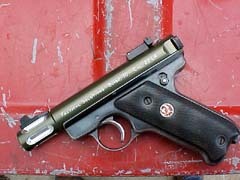 While I love my Mark II Target pistol, it doesn’t get carried by me very often due to the weight of the pistol. Tactical Solutions has started cranking out high quality, lightweight, and very accurate replacement barrels for the Ruger auto. This is one of those ideas that is simple, but way overdue. 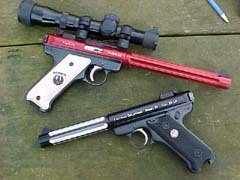 The addition of their Pac-Lite barrel to a Ruger auto does wonders for the handling and packing qualities of the pistol. I usually sacrifice some accuracy when carrying a twenty-two pistol afield by leaving my Mark II at home and carrying my old Colt Huntsman instead. While the Colt will not shoot as well as the Ruger, it weighs a good half pound less, and that makes a difference when packing the gun all day. 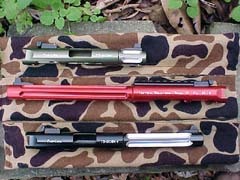 The Pac-Lite replacement barrels are made of aluminum alloy, and have a steel barrel liner. 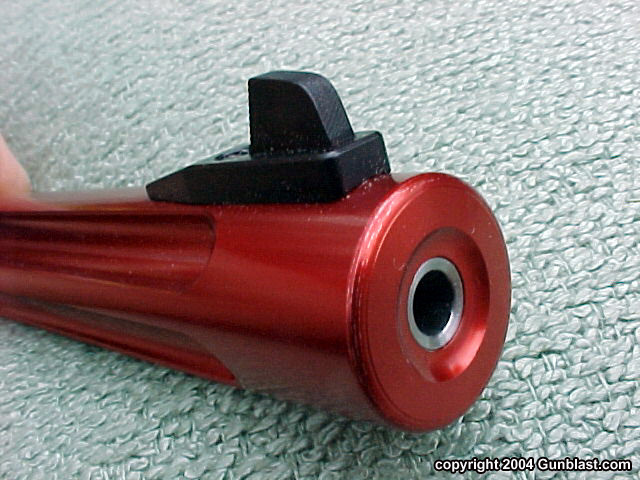 This allows a weight savings of about three-quarters of a pound using equal barrel lengths. 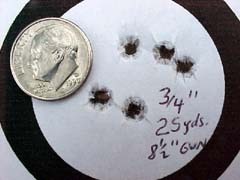 The Pac-Lite six inch bull unit weighs almost thirteen ounces less than the Ruger five and one-half inch target barrel, and six ounces less than the Ruger tapered four inch fixed-sight unit. 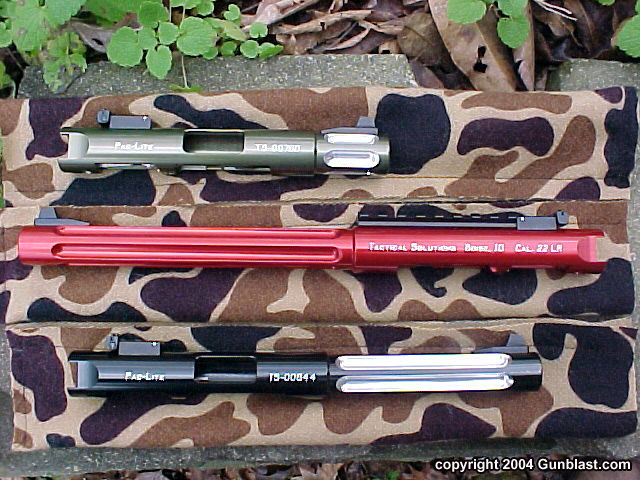 Tactical Solutions recently sent to me three units for testing, all with bull barrels, in lengths of three, six, and eight-and-one-half inches. 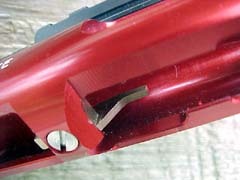 The Pac-Lite barrels are not screwed to a receiver as are the Ruger factory units. The Pac-Lite barrel and receiver are machined as a unit from a single length of alloy. The Pac-Lite comes with sights and ejector already installed, and swapping it for the factory barrel is a simple procedure. The Pac-Lite comes with detailed instructions, and if you can field strip a Ruger auto for cleaning, you can easily install the new barrel in about two minutes. While the Pac-Lite barrels are beautifully machined and finished, the proof, as always, is in the shooting. I assembled the three units sent onto three different Ruger lower frames. 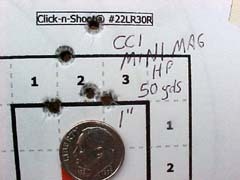 First, I used a Ruger Mark II Target model that has a Clark trigger installed. 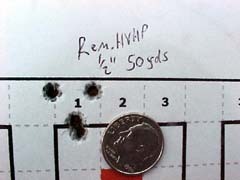 This is one of the best-shooting twenty-twos that I have ever fired, including several high-dollar full blown target autos. 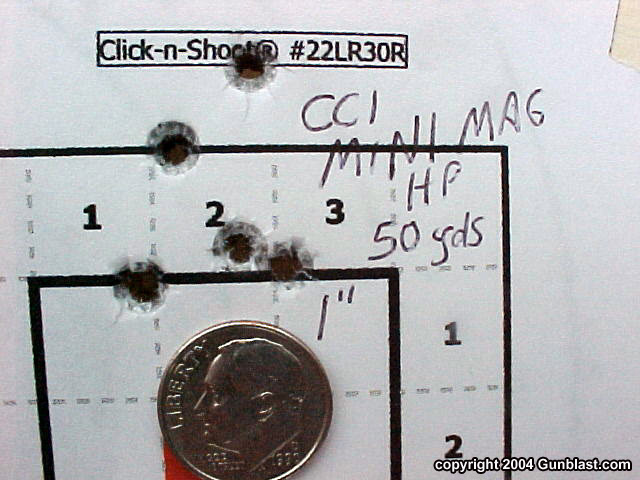 The second gun that I used was an unfired fiftieth anniversary Mark II auto. 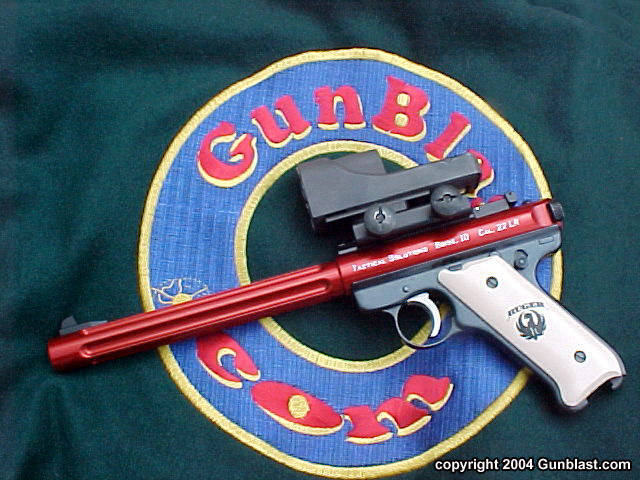 The other gun that I used for a test bed is a vintage 1949 Standard Auto, commonly referred to as the Red Eagle. 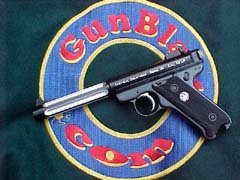 This gave me a good variation of Ruger autos spanning fifty years of manufacture. 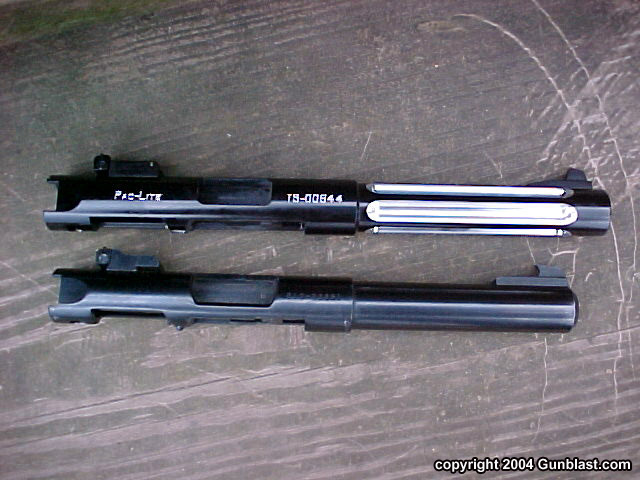 Installing the Pac-Lite barrels revealed that while the fit was snug, they slid right on to the lowers with just a little effort. I applied a bit of grease to the connecting surfaces, and lightly tapped the barrels in place with a wooden handle. First, I proceeded with function testing, firing many different brands of ammunition through the three guns. I used standard velocity target ammo, high velocity hollow points, subsonic loads, hyper-velocity truncated cone ammunition, and everything else that I could scramble together. All three of the guns performed flawlessly, so I switched the barrels onto different lowers and started over again. As before, the guns functioned perfectly. This is a stunning testimony to the basic Ruger design and to the production of the upper barrel assemblies by Tactical Solutions. I was really a bit surprised that all three brand new units worked perfectly on the three guns. 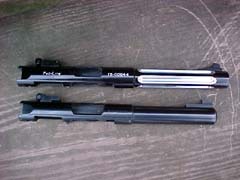 The accuracy of the Pac-Lite barrels was also a pleasant surprise. As can be seen in the photos, the performance was very satisfactory. 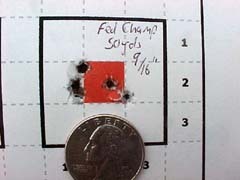 Using a rest and the six inch barrel with open sights, most ammo grouped into less than one inch at twenty-five yards. Using the eight and one-half inch barreled gun with a two-power scope, I was able to cut the size of those groups in half. 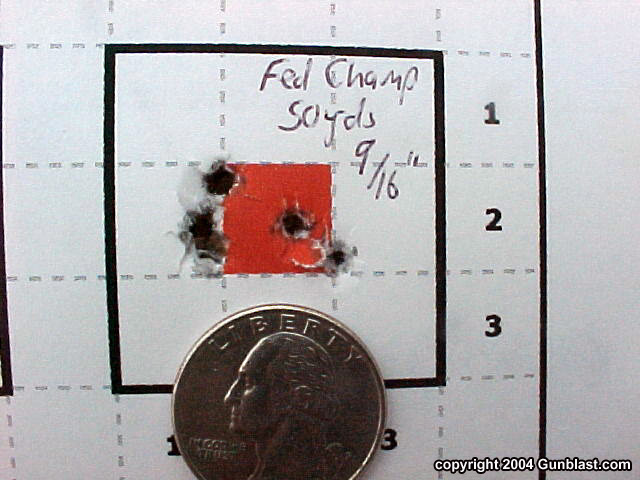 Moving out to fifty yards and using a more powerful scope, I got several groups in the half-inch range, despite a strong crosswind. While the three inch gun could theoretically be just as accurate, I used it only for some plinking at small rocks and a steel plate. To me, it is shorter than I like on a full sized twenty-two, and I greatly prefer the two longer barreled units. In the course of running in excess of several hundred rounds of ammunition through the guns, I developed a preference for the six inch barreled unit for a general duty packing gun. While it closely resembles the size of my Mark II Target pistol, it weighs twelve ounces less with a barrel that is one-half inch longer. 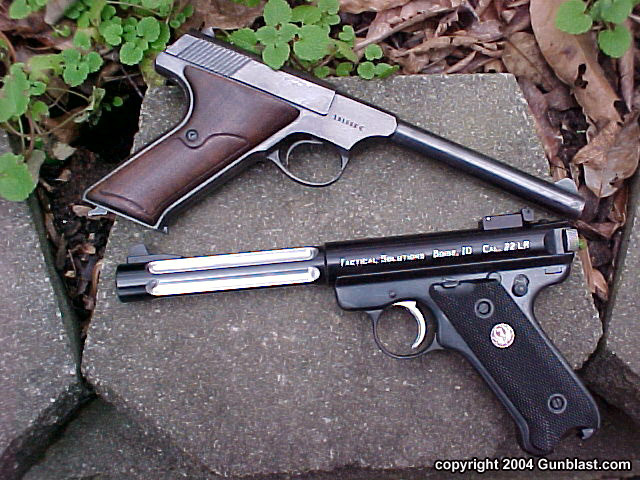 The balance of the gun is dramatically changed, and it handles much better than before. The fluted bull barrel seems to float in front of the gun. 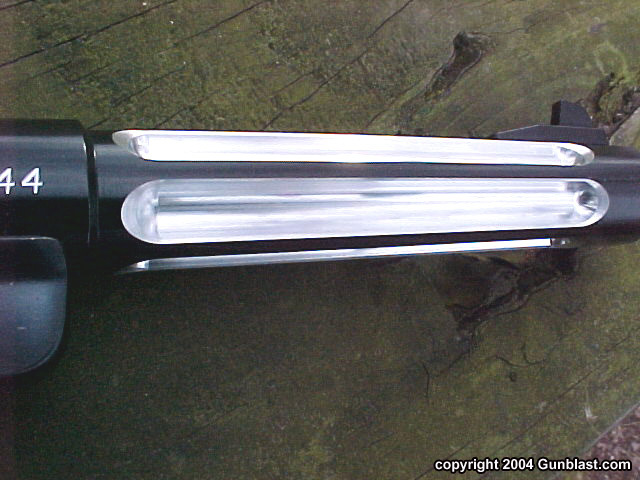 It points naturally, and balances perfectly, with the balance point just behind the trigger. For a dedicated hunting twenty-two, I have dubbed the eight and one-half inch scope sighted gun the "Squirrel Getter Supreme". It is a good balance of barrel length, bulk, and shootability. 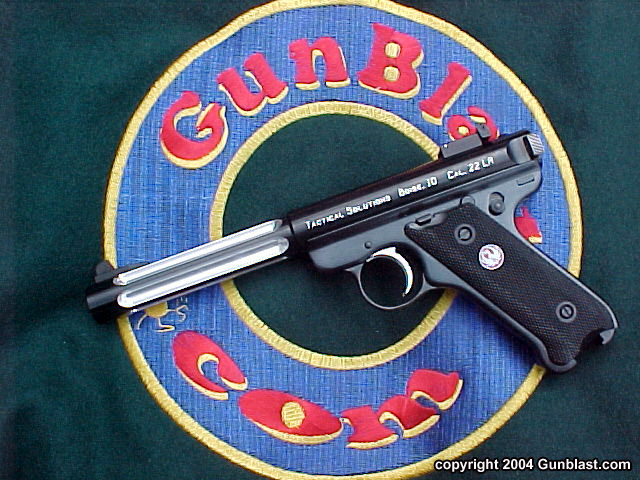 It is a very accurate pistol, and would serve equally well as a rimfire silhouette pistol. 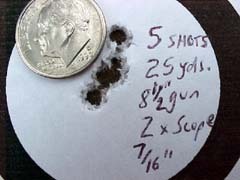 Federal hollow point ammunition chronographed in excess of 1250 feet-per-second out of the long barrel, and grouped into three-quarters of an inch at fifty yards. 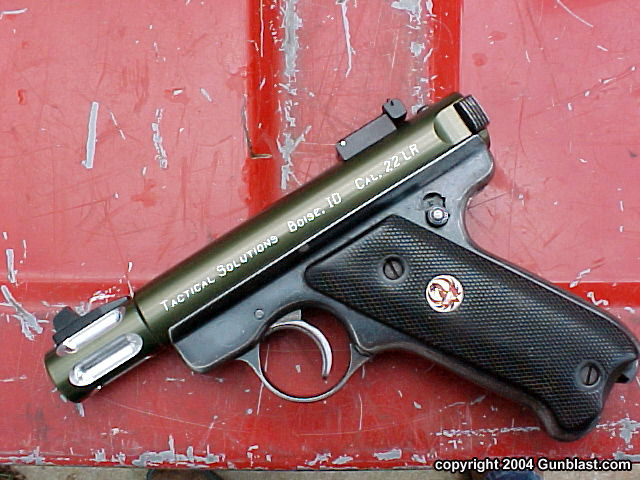 I can think of no better handgun for hunting tree squirrels. 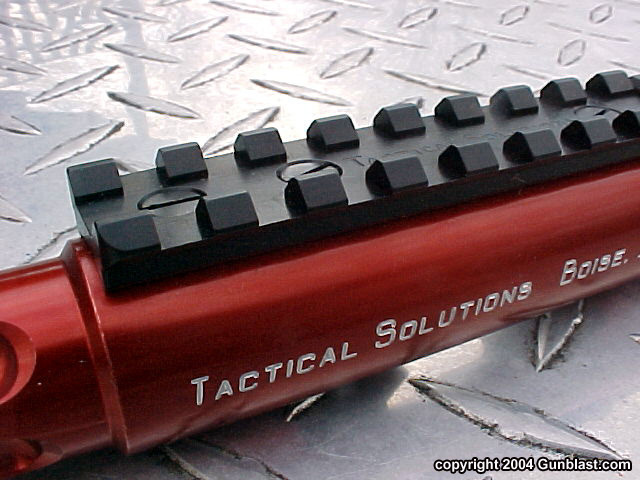 Tactical Solutions has come up with a great product in these Pac-Lite barrels. As can be seen in the photos, they also offer them in several unique colors. While I prefer the black barrel, there are several choices available for those who like a little wilder look to their auto pistols. The fluting on the bull barrels is superbly executed, and offers a nice cosmetic touch while further reducing the weight without sacrificing rigidity. 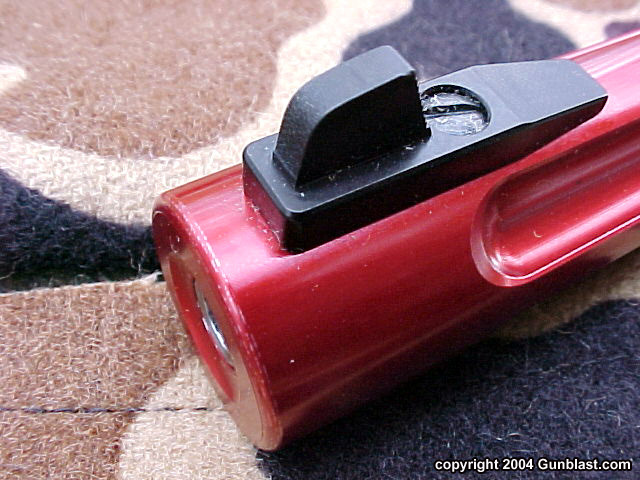 The scope mount does not interfere with the use of the open sights with the scope removed, and offers a solid base for which to secure a scope or dot sight. I mounted a Trijicon dot to the long barreled unit, and it made for a very shootable plinker. 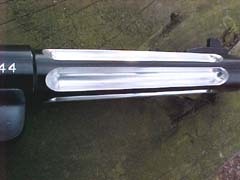 Being a barrel and receiver unit, the Pac-Lite is defined for legal purposes a handgun, and must be purchased as such. 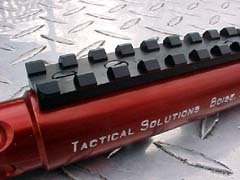 For a look at the many variations and a list of dealers who sell the Pac-Lite, check them out online at: www.tacticalsol.com. If your favorite dealer is not listed, he should be. Tell him to contact Tactical Solutions. Going back to the question posed in the opening paragraph of this article, I would hate to have to choose but one handgun for all my needs. However, if forced to do so, I now have a new answer. It would be a Ruger .22 Target automatic with a six-inch Pac-Lite barrel. I like it that much, and I highly recommend it. Pac-Lite 8-1/2" receiver unit with Trijicon dot sight on author's Ruger Mark II Target frame with Clark trigger. 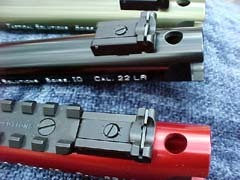 Pac-Lite receiver units tested (top to bottom): 3" olive anodized with silver flutes, 8-1/2" red anodized, 6" black anodized with silver flutes. Units are available in a wide variety of colors. Pac-Lite receiver units tested (top to bottom): 6" black anodized with silver flutes on Ruger Mark II frame, 3" olive anodized with silver flutes on 1949 Ruger "Red Eagle" frame, 8-1/2" red anodized on Mark II Target frame with Clark trigger and Trijicon dot sight. Author's favorite was the 6" black anodized unit, offering the best compromise of accuracy and portability. The 3" olive anodized unit on Jeff's 1949 "Red Eagle" frame made for a very lightweight and handy plinking/trail gun. Top: 8-1/2" "Squirrel Getter Supreme"; bottom: Jeff's favorite packing combination, the 6" black anodized unit. Pac-Lite 6" receiver unit (top) weighs 3/4 pound less than Ruger 5-1/2" bull barrel upper. 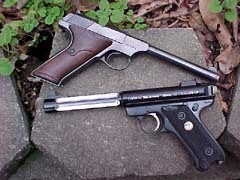 Author's old Colt Huntsman outweighs the Pac-Lite 6" unit on Ruger Mark II frame by a full four ounces. Steel ejector is perfectly positioned and shaped for positive and flawless function every time. Fluted barrel reduces weight and adds a distinctive appearance, while the steel barrel liner and target crown aids durability and accuracy. As a further aid to practical accuracy, the Pac-Lite barrel units feature quality adjustable sights. 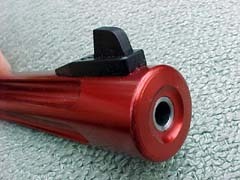 Scope base is available for any barrel length. As these 25 and 50-yard groups demonstrate, the Pac-Lite units are not just lightweight and beautiful, but very accurate. The folks at Tactical Solutions have truly "built a better mousetrap" with their Pac-Lite receiver units, and the reasonable prices just make them that much better. Highly recommended.